Basically, a yacht shows up at the New York City port and when investigated, there is a zombie or two on board. Four people try to put the pieces together and figure out this yacht came from a small Caribbean island, which is where these four people journey out there in search of what happened. Once they arrive, a ton of zombie hordes attack and they must try and survive and get back to NYC. 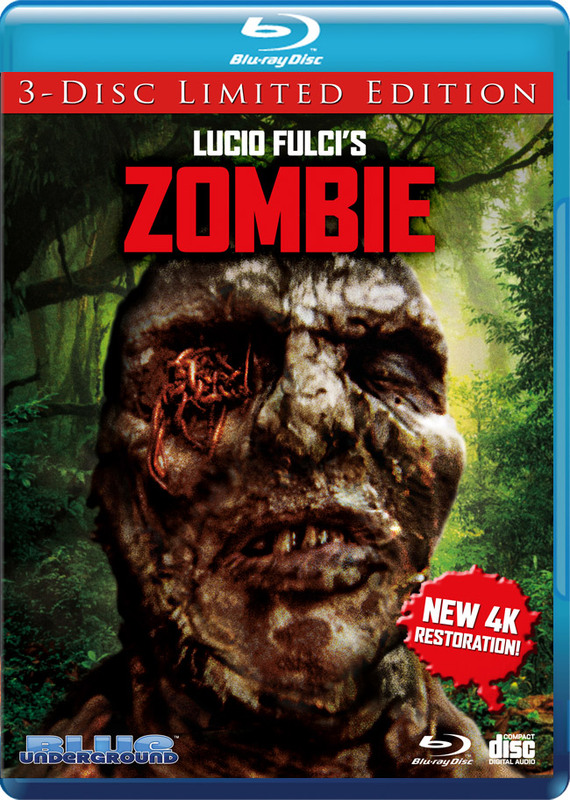 With tons of excellent visual effects, iconic scenes, and deaths – ‘Zombi’ stands out from the rest of the genre. Luckily, Blue Underground has released a 3 Disc set on Blu-ray, complete with soundtrack on CD in this limited edition. It’s amazing. MUST-OWN for all horror fans. This entry was posted on Wednesday, December 12th, 2018 at 4:43 pm	and is filed under Film, News, Podcast. You can follow any responses to this entry through the RSS 2.0 feed. You can skip to the end and leave a response. Pinging is currently not allowed.